The (secret ingredient) healthy pudding! Sorry for leaving you guys hanging when I mentioned the chocolate pudding in the Frozen Avocado post. Today I will show you how to make it! Shhh. The secret ingredient is avocados. Don’t tell anyone who wouldn’t like it if they knew! When my older sister came home from college this summer, my mom and I put her on the GAPS diet. She is doing pretty well on it, but the food can get boring. She tries adding new things into her diet, but reactions are still frequent for her. This is a sign she might be introducing foods too fast. To help with the variety of food that she can tolerate, I decided to add something very tasty into her diet. It wasn’t long after I made this pudding that she would constantly ask for it! Thats how good it is! I also served this pudding in little cups at my graduation party. No one knew that these were healthy. Better yet, one of my friends who tried this hates avocado’s and she LOVED the pudding. I never told her that it had avocados in it ;). Sometimes it is better not to say anything about the ingredients in food around here! I hope you like this recipe as much as my family does. It has become a staple in my house! 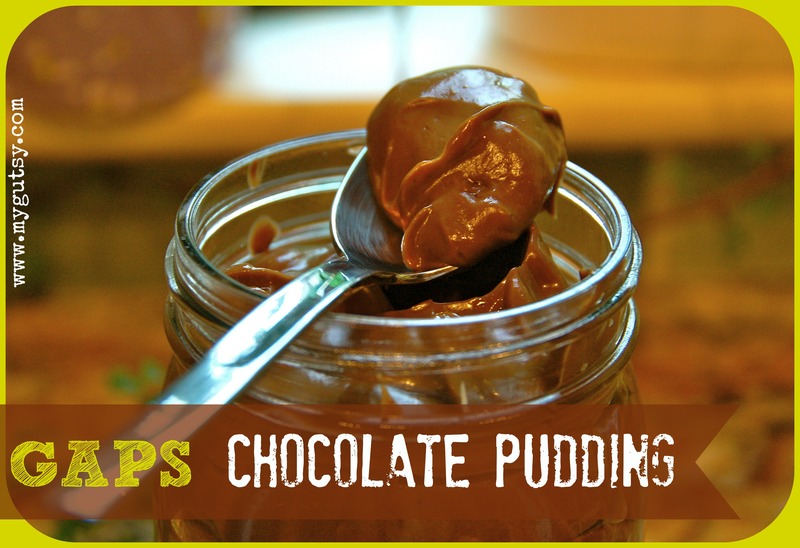 This chocolate pudding is rich though, so don’t over do it. It is sure easy to, because it tastes so delicious!! 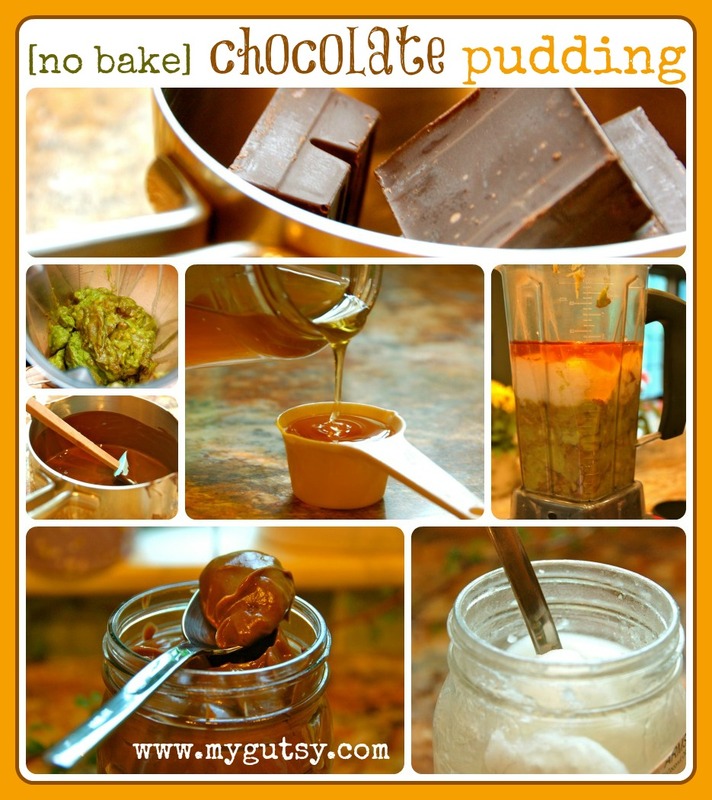 *This recipe makes about 6 cups of chocolate pudding. It lasts for 1-2 weeks in your fridge. It might even last longer, but mine has not lasted that long without being eaten! You can always make half a batch if you want. 2. Put smashed avocado’s in a big bowl. 3. ** If you are using the bakers unsweetned chocolate…Unwrap and melt the chocolate in a double boiler (or a heat proof bowl over boiling water). If you cut up the pieces of chocolate, it will melt faster and easier. 4. Add the coconut oil (melted), honey, salt, melted chocolate or cocoa powder, and vanilla to the bowl. Roughly stir to incorporate all ingredients. 6. 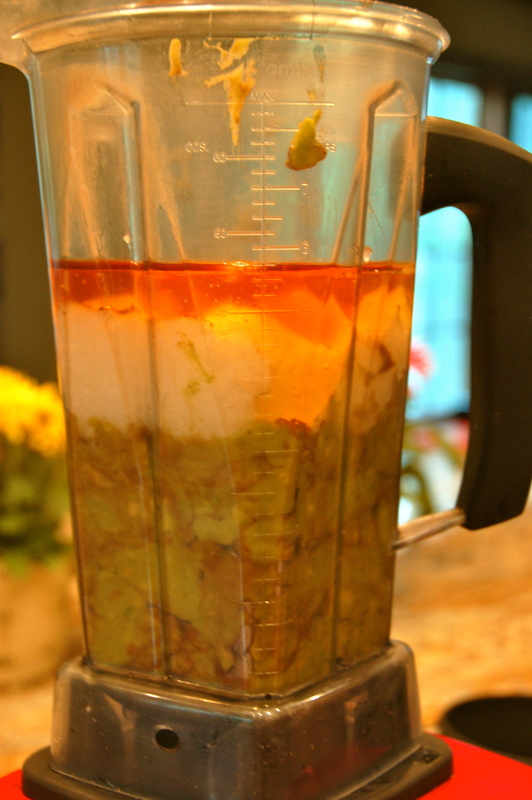 Blend all together. I actually had to blend in 2 batches because it seems to put less stress on the blender and it runs smoother. 7. Scrape out the blended pudding into a container or a ball jar (I like to use a small spatula). 8. Blend the other half of the pudding. If you have a Vitamix, it is helpful to use the black plunger to keep the blade running, because this pudding is thick! If you don’t, you might have to stop the blender or Cuisinart to stir it a few times. 9. Scrape the other half of the pudding out of the blender. 10. Serve just as is! Refrigerate leftovers (I always make a big batch of GAPS foods because it is easier to make a big batch of one recipe, than remaking it over and over again. I like to save time). * It will be hard when you take it out of the fridge (the coconut oil turns hard when cold). 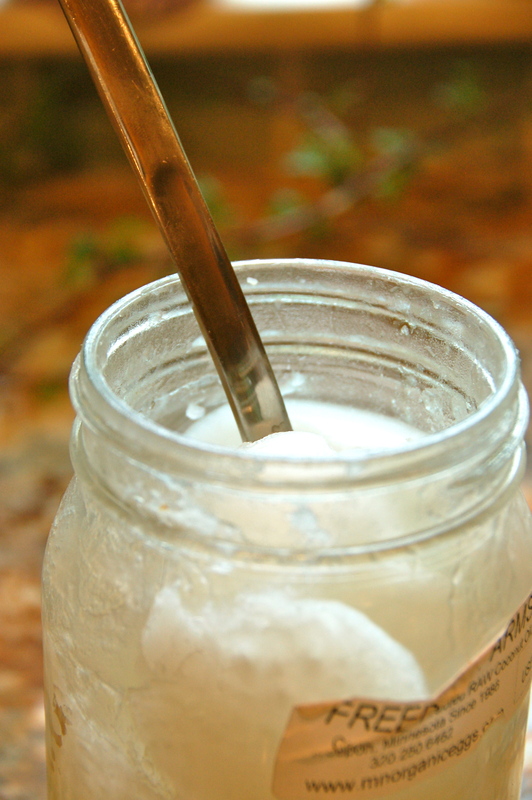 If you like a softer texture, just keep it on the counter for 15 min and stir before you eat. Cold tastes just as good though. Instead of the baker’s squares, could you use unsweetened cocoa powder? Any ideas? Yep sure you could! I would probably add 1 or more cup of powder because the chocolate squares are packed with chocolate flavor!! I’ve made this with the powder and it’s really good! I also used a stick blender and got very silky pudding. Wow, Caroline! So satisfying! I couldn’t believe how rich this was. Definitely the most decadent thing we’ve eaten yet on GAPS. By the way, I used an electric mixer to whip it smooth because my blender is kind of wimpy and I hate getting thick things out of it. Yes, that is exactly what my sister and mom said too! I cannot have chocolate 🙁 and avocados have a cross to latex (which I am allergic to)…my food list is so small now, I am not even sure I have gotten anywhere on the GAPS diet, but I will keep trying. If you haven’t got the clue, I still make food and test recipes on my family, I just don’t eat them. Electric betters are Great! so smart! Ohh creative recipe you concocted there Christine! The bakers has no sugar though so my recipe is GAPS friendly. Could you use liquid stevia instead of honey? If so, how much? I made this and it was wonderful! It was such a good amount that I used half to make “fudgesicles” 🙂 They are UH-MAZING. Better than I remember as a kid! Such a great idea!! Wow, i will have to try that now too! So very yummy!!!!! It’s super good with a couple of raspberries on the side.